MINISTER for Transport Gladys Berejiklian has joined State MP for Heathcote Lee Evans at Austinmer to announce Opal electronic ticketing will go live for customers on all 200 local buses on Monday November 3. Ms Berejiklian said the NSW Government is getting on with the job of delivering modern and convenient public transport, with Opal now live on all suburban and intercity trains, all Sydney Ferries and more than 4,300 buses. 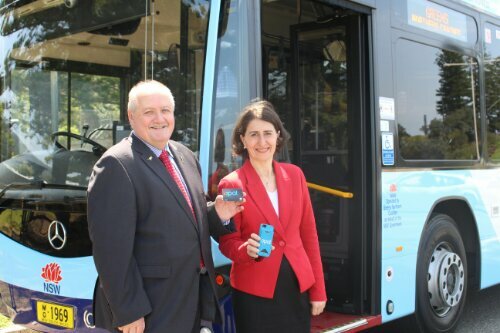 Ms Berejiklian said she was pleased that from next month Illawarra bus customers will be able to access cheaper fares and more convenient travel, with electronic ticketing on 200 buses across 30 routes from Stanwell Park to Shellharbour. “The latest rollout of Opal will cover buses which serve thousands of customers in communities across 90 Illawarra suburbs,” Ms Berejiklian said. “After waiting 16 years for Labor’s failed attempts to deliver electronic ticketing, we’re finally catching up with the rest of the world. “The people of NSW are embracing Opal and taking advantage of cheaper, easier and more convenient travel with more than 1.1 million Opal cards now issued to public transport customers. From Monday 3 November, customers using 170 Premier Illawarra buses across 24 routes in Bellambi, Corrimal, Fairy Meadow, Wollongong, Port Kembla, Unanderra, Dapto, Albion Park and Shellharbour can tap on and tap off with an Opal card. Greens and Dions buses will also go live, transporting customers across 15 suburbs on 30 buses including Austinmer, Bulli, Stanwell Park, Thirroul, Coledale, Russell Vale and Woonona areas. Mr Evans said Illawarra train customers have been using Opal on South Coast Line intercity services since April this year and this rollout on buses will make travel seamless. Mr Evans said customers can get their Opal card at a local retailer or have it sent to their home by ordering a card on the Opal website or calling Opal on 13 67 25. “We’re talking to newsagencies and corner stores throughout the region to encourage them to come on board as Opal retailers, with numbers growing all the time. Opal top-up machines at stations will be available later in the rollout,” he said.